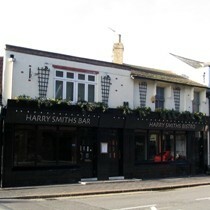 Harry Smiths in St Albans is a small, dimly lit wine bar with the bar serving area at the back. A couple of chaps were watching the football on the plasma screen but other than that the place was very quiet (9pm on a Thursday). They had no real ale and a poor selection of lager. No wine list was available and the bar staff were a little unhelpful at the time of the review. It would only take about thirty drinkers to make theis place feel very squashed and there are very few seats available. Standing near the back you could smell the toilets, fellow drinkers informed me that the toilets were very unpleasant. This is one to avoid. Now serving London Pride but not the best quality. Hopefully the real ale option will last but somehow I doubt it. The extra room to the right of the bar is very comfortable with nice armchairs. Harry Smiths has closed down. To become a Brasserie Blanc opening in July 2012.